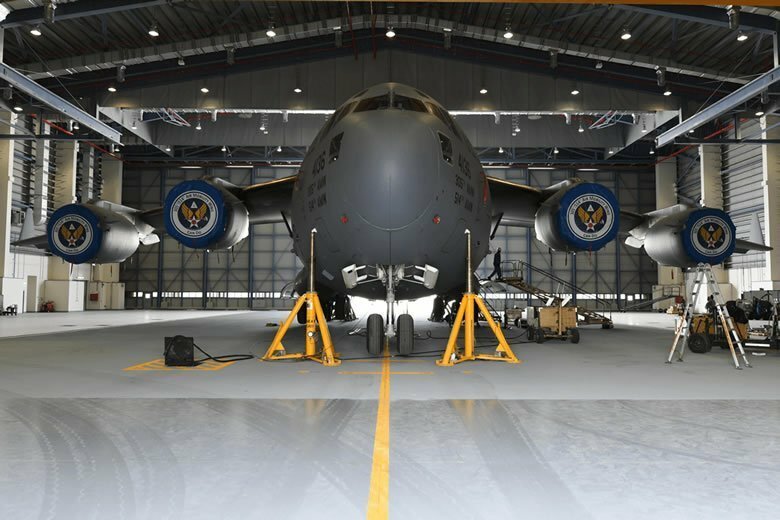 Installing firefighting equipment in aircraft hangars is as much about protecting the aircraft as it is the hangar itself, such is the cost differentiation between the hangar and its contents. Solutions have to be fast, effective and unerringly reliable if multi-million dollar aircraft are to be safeguarded. Asia Pacific Fire’s editor, Graham Collins, recently witnessed a system being commissioned at a new hangar at Brisbane Airport – a “first” in Australia -that may well be destined to become the aviation industry’s preferred solution. Brisbane Airport is Australia’s fastest growing airport with, according to Airservices Australia, currently 37,608 movements and more than 21 million passengers a year. It is also a central hub for aircraft maintenance, hosting major maintenance facilities for both Virgin Blue and Qantas. Indeed, Qantas has recently announced that it was adding to its Brisbane maintenance facility as work is transferred from Melbourne. The airport is also home to a fast growing list of leading aviation service providers and several additional hangers have recently been built or are under construction along the airport’s eastern perimeter. Traditionally, hangers, or to be more precise, the expensive aviation assets they house, are protected by either an AFFF deluge system or oscillating foam monitors. These solutions are not without serious shortcomings; in particular their lack of speed in extinguishing a typical hanger fire and the excessive amount of water used. There have also recently been several instances around the world where there have been unnecessary or excessive discharges of foam that have caused costly damage to aircraft and the unacceptable release of foam into the environment. So much so that when Brisbane-based aviation supplier, Five Star Aviation, appointed international hanger construction specialist, Bettabuilt, to build a new 2500 square metre hangar at Brisbane Airport it took advice from Brisbane-based fire engineering consultants, Fire Engineering Solutions. The outcome was a solution to the hangar fire protection challenge that has just been installed, commissioned and tested and is believed to be the first of its kind in Australia. It was project managed by Fire Engineering Solutions and the equipment was supplied by Delta Fire Australasia. Hanger fire protection has been under the spotlight for some time by hanger owners and tenants, insurers of aircraft using the facilities and from Australia’s federally-run airport authorities. This has resulted in a policy coming into force at Brisbane Airport that dictates that hangars will be approved only if their design prevents the release to the environment of any pollutants spilled inside the hanger – including fuel spills, contaminated water and foam. Speed of response was also a critical consideration if damage to aircraft was to be minimised. According the USA’s Federal Aviation Administration, tests have indicated that an aircraft fuselage skin exposed to fire could fail within just 45 seconds. However, once a fire has been extinguished, unnecessarily discharging more firefighting agent is costly, clean-up is more extensive, disruptive and time consuming, and containing the excessive foam adds to the cost and challenge of containment and disposal. So the brief for the new Five Star Aviation hanger called for a solution that would be activated only in the event of a genuine fire, and that would use only the necessary volume of foam to extinguish the blaze. Other essential requirements included the need for the overall hanger fire protection solution to facilitate ARFF (Airport Rescue & Fire Fighting) and QFRS (Queensland Fire & Rescue) operations and compliance with the Australian Building Code. Cost effectiveness and ease of maintenance were also major considerations for the solution’s designers. The solution devised by Fire Engineering Solutions is described by the consultancy as “a simple but elegantly engineered solution” and encompasses several interrelated elements such as a brigade-connected fire alarm, sprinkler fire suppression in the office areas, a hydrant system both air-side and land-side, and hose reels and portable extinguishers. However, the two elements that set this installation apart are the use of a high-expansion foam deluge system that is triggered by flame detectors, and the foam capture and storage facilities. Triple infrared flame detectors, designed for long distance detection and high false alarm immunity, are positioned in each corner to cover the entire hanger. To avoid unwarranted discharge of the foam, the flame detection system is configured to require two detectors to register the fire before the foam is discharged. However, the activation of the first detector raises the alarm both internally and at the airport’s ARFF control centre. Four manual control stations are positioned adjacent to fire exits and these can be used to either start or stop the foam discharge, as can the control station in the fire pump house located alongside the hanger. The foam is proportioned from special high-expansion concentrate and requires less than 1000 litres of concentrate to operate the system for 15 minutes. It is discharged from 36 high-level generators supported off the steel structure’s trusses. This deluge, when activated by either the flame detectors or the manual control stations delivers about 2000 cubic metres a minute of bio-degradable high-expansion foam at an expansion ratio of between 650:1 and 700:1. Significantly, this means that the solution uses just one percent of the water that would be used by a comparable foam monitor installation. The system simultaneously delivers a foam blanket across the hanger’s entire 50-metre by 50-metre floor area at the rate of 0.85 metres-a-minute or 0.3 metres in 21 seconds, which FM Global tests show is sufficient to suppress a fuel spill fire. Even so, sufficient foam concentrate is held in the system to continue discharging throughout the hangar for 15 minutes, at which time the discharge is stopped automatically. A further 15-minute supply can be activated manually. Two fire pumps are installed to ensure that an adequate water supply is available during pump maintenance. They are configured so that the second pump will start within five seconds if the first pump fails to start. These fire pumps are stopped manually. The foam deluge system controls are separate from the fire alarm system to ensure the maximum operational availability of both systems. Discharge of the foam ceases as soon as fewer than two flame detectors no longer register the presence of a fire. This ensures that the amount of foam discharged is the minimum required to extinguish the fire, which reduces the risk of damage to the aircraft, ensures faster clean-up and reduces the volume of liquid that will end up in the capture tank. However, in the unlikely event that the fire again breaks out, the manual controls enable the discharge to be recommenced immediately. This inexpensive and reliable type of deluge system has several significant advantages over other hanger firefighting systems. The lightweight foam generators are hung directly in the supply pipes and reduce the weight on the roof; the pipes are not under pressure and water is not stored in the pipework – again reducing the weight on the roof; they have no moving parts and so cause minimal maintenance disruption in the hanger. In addition to not requiring an electrical supply, they do not require external air for foam production – the system creates foam from smoke gases, smoke-contaminated air and hot air. This leads to a rapid decease in temperature in the room as the hot aired is cooled in the generators, where it is aspirated and sprayed with water from the generator nozzles. Smoke emissions are reduced and fire ventilation is unnecessary. These features combine to deliver an extremely cost-efficient solution and one, in the designers’ view, that is the least-cost option for hanger protection. The foam spreads horizontally better than foam from fan-driven generators that deliver higher expansion ratios, and an effective blanket is formed quicker with high-expansion foam than with either low-expansion or medium-expansion foams or AFFF foams. Additionally, the low water content of the foam will help prevent penetration of aircraft interior surfaces or into concealed spaces beneath the floor. Indeed, the low water content of high-expansion foam makes its use very attractive to environmentalists and others concerned with water management. Australia is a country where water is a scarce commodity and securing water supplies and using water wisely are high priorities. To satisfy Brisbane Airport Corporation’s environmental directive that no pollutants should be allowed to escape from the hanger, the hanger floor slopes towards a drain at the hanger door. Any liquids are collected in this drain and are contained in an underground tank beneath the fire pump house for licenced disposal off-site. This tank has a capacity to store approximately 61 cubic metres; more than sufficient to contain the 49 cubic metres of a 15-minute foam discharge and any other drained liquids. This compares with traditional hanger fire protection systems that would require tanks with capacities of between 300 cubic metres and 500 cubic metres. A level indicator switch is incorporated to monitor the level of the liquid in the Five Star Aviation tank; when the capacity remaining approaches the 49 cubic metres required for a 15-minute foam discharge level a sounder indicates that the tank needs to be pumped out. Considerable care has evidently gone into the design to simplify maintenance and operability. For example, in addition to normal brigade isolation, a switch has been included to close the foam concentrate valve to ensure foam is not discharged during maintenance tests. When the deluge system is periodically tested, all tests are carried out with air to avoid unnecessary foam discharge. Such is the system’s simplicity that just three indicators and only two types of push button are required for operation. A full-scale commissioning test was carried out in November, which was witnessed by both Brisbane Fire & Rescue and the airports ARFF personnel. To test the sensitivity and reliability of the triple infra-red flame detectors, a small fire pan was lit on the floor near the middle of the hanger. All four detectors, which were set at their lowest level of sensitivity, activated within 15 seconds of ignition. At normal sensitivity settings the detectors will operate within three-to-five seconds in response to a typical fuel spill fire. Within 14 second of the deluge commencing, foam discharge had started from all 36 generators. A 20 to 30 second discharge would be required to suppress a fuel fire to the point where its flames would not be high enough to threaten aircraft above the fuel spill. However, for this test, the fire pan had been slightly elevated above floor level and positioned in the most challenging position for detection and extinguishing, so it took a little longer to extinguish the fire in the pan. When this occurred, the flame detectors stopped registering the presence of a fire and the foam discharge ceased. The manual control buttons were tested to ensure that the foam discharge could be stopped and started manually. The minimum design criteria required by NFPA 11 is 0.3 metres a minute with the hanger doors open. This allowance for leakage through the hanger doors and other openings varies according to the depth of the foam blanket, which could be as high as 12 to 13 metres after 15 minutes. The system was designed to flood the hanger at the rate of 0.85 metres-a-minute with the hanger doors closed. At the end of the test the mean depth of the foam blanket was 1.2 metres, equating to 0.9 metres-a-minute.